A Sydney man has won $6.87 million in this week’s Lucky Lotteries Super Jackpot, a draw where the winner keeps the entire jackpot to themselves. The man, who wishes to remain anonymous, describes himself as an animal lover and plans to donate a percentage of his life-changing winnings to charities, while also sharing it with his family. 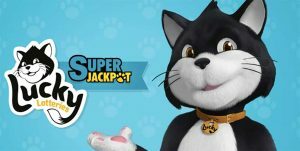 The man purchased tickets into the Lucky Lotteries Super Jackpot, a lottery game that gives players the chance to win the entire jackpot for just over $2 a game. The draw is different to standard lotteries, as a player purchases a ticket with a unique set of numbers on it, and the player with the winning ticket keeps the entire division 1 prize. Other lotto draws, on the other hand, are split between players who picked the same winning combination of numbers. Lottoland, which offers punters the chance to bet on the outcome of international lotteries, like the UK Lotto, has a feature known as the ‘Number Shield’, which protects your numbers and allows you to win the entire division prize. NSW Lotteries official told the man he won the entire jackpot of the 10207 draw on January 15, 2018, earlier this week, and, naturally, he was astonished. “Are you serious? Wow, wow, wow! S—, s—, s—,” said the man, upon hearing the life-changing news. “I never win anything and I always buy tickets. The man purchased 10 consecutive games, which have since made him a millionaire. But he plans to be quite humble with his winnings. “I’m a big person for charity – helping those who don’t have the money to pay themselves,” he said. At the time of writing, the Lucky Lotteries draw is at $500,000, while the Mega Jackpot has climbed to $7 million. You can purchase your tickets into the official draw online at Oz Lotteries, by heading to the Lotto Games page and clicking on the respective draw, provided you don’t live in Queensland.